The story behind all the Megadeth albums!! Megadeth, the Californian headbanging thrash metal band (1983), with original founding members like Dave Mustaine n’ Ellefson became the part of the BIG FOUR along with Anthrax, Metallica, Slayer!! And became one of the proud members of the history of Thrash Metal Genre!! DAMN…. Megadeth, as a Thrash Metal band became popular like hell because of their unique technical capabilities with headbanging albums rhythm along with the scary theme of their lyrics on their albums, with the presence of corrupted politics and the deaths for the waging wars because of it. How cool is that huh?! Their albums are well known because of creating so many of Gold, Platinum, Grammy-winning albums all over the world!! Which depicted the ruling of their unique albums, over World metal scenario as a king!! “I was out for blood, theirs”. Dave Mustaine. 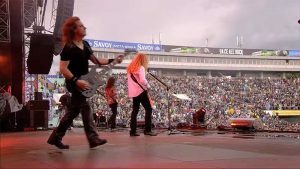 After searching among several drummers of Megadeth Mustaine n’ Ellefson and choose Samuelson to burn the stage out and decided himself (Mustaine) as a Key vocal, guitar player, Lyricists, signed themselves with independent record level for their touring with their huge budget!! The first ever debut album of the Megadeth, with the iconic essence of pure Thrash metal of massive guitar works, compositions which made the Thrash metal as a unique sub-genre of mighty Heavy Metal!! Their lyrics deal with Scary deaths, violence, political secretive issues etc. The lyrics of that album was full of metaphors and imageries which made their Royal journey of Thrash metal just like a king!! But after got several threats from the critics and music world as well they were a force to re-released edited and censored versions of it mostly because of their song “These Boots Are Made for Walking”. 2nd studio album (1986), last album of their guitarist and drummer, Chris Poland n’ Gar Samuelson because of their drug scandal. In this album, their political lyrics dominated like hell just like their reputations and because of it that album considered some extreme metal albums and got several awards for Platinum, gold etc. Listed as top 500 best heavy metal album of all time and remastered several times because of its huge popularity. This album leads their symbolic social awareness, political insecurities, scary negative metaphors etc. Megadeth took that unique title of that album from an article of Readers Digest!! Even two of their band members were homeless during the recording period of that album which indicates how pathetic and frustrating their situations they were facing on that moment which paved their way of writing political and anti-social lyrics of that album anyway!! WOW!! 😀 A big salute to them!! Musical critics accepted the lyrics of that album with great appreciation and they got huge popularity and most technically proficient album of Megadeth!! COOL!! 3rd mind blowing Thrash Metal albums by the production of the Megadeth!! which proved their technical ability and mastering over their faster tempos which secured their potion among top 30’z on the Billboard 200. On that album, Chris and Samuelson got fired because of their abusive behavior and replaced by the Reynolds and Chuck as Drummer and Guitar player. 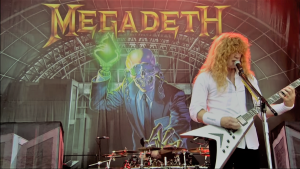 According to the musical critics, the lyrics of that album depicted the picture of the pain and frustrations, loneliness, and Isolations of a creative soul, even Megadeth faced censorship because of that! 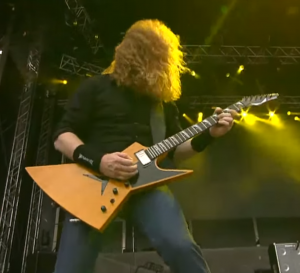 and Mustaine screamed the hell out of his singing style! LOLZ. 4th studio album, and very first album of the Marty and Nick that was the pioneer progressive metal album which brought Megadeth in the mainstream of the Metal scenario in front of the world!! Which listed them on the top 1001 albums you must hear before you die and nominated themselves at the for the Grammy awards Because of their best metal performance!! COOOOL!!? This time Megadeth wrote their lyrics based on UFO’s and Nuclear war and went away for their North American tour!! Even their album artwork sketched out the world leaders as an Alien themselves!! Lolzz. Musical critics nominated that album as the fourth most influential metal album of all time!! DAMN!! That 5th Megadeth album helped them to flourish their popularity outside of the USA. 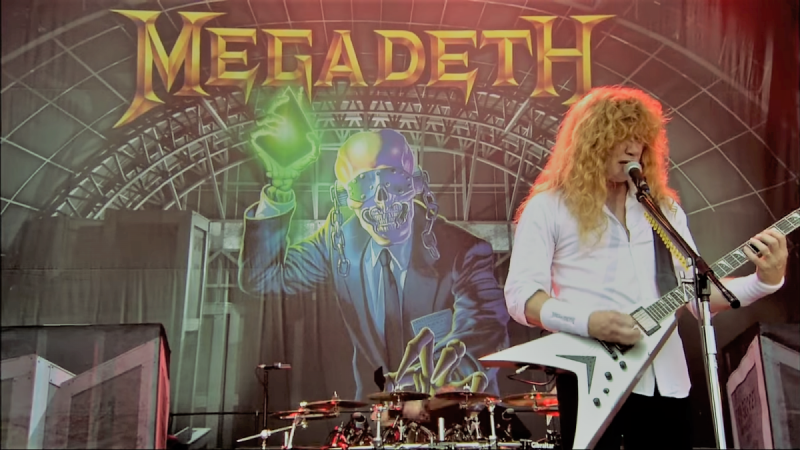 Megadeth countdown to extinction is Not only tagged themselves on the Billboard 200 and two platinum awards!! They provoke their messages, cruelty against animal and their rights as well. after the dynamic popularity of that album, Megadeth started sharing their stage bands like Aerosmith, Metallica!! DAMN!!? 6th head -banging album conveyed their progressive style to melody!! This time Megadeth was able to get Gold and platinum certification with several international awards as well!! This time they started to contribute themselves on soundtracks and tribute albums from their socially concerned perspective!! COOL!! That 7th Megadeth album conquered at top 10 of the Billboard 200 and awarded with Grammy!! WOW. That album got it’ huge popularity because of an experimental Genre and secured their position at #10th on US Billboard chart and certified as platinum and was able to sell 500000+ copies of their album only in the US!!? That 8th Megadeth album paved their way to go back to their roots of heavy metal!! A tribute album for their late drummer Gar Samuelson. And went away for their world tour as well. That shows their responsibilities towards their band members not only for the alive ones but also for the dead’s as well. That album considered a flop album but still secured their position at #16th on the Billboard 200 charts!!? A more aggressive and unique comeback of Megadeth in their 9th albums which leads them to a secured #16th position at Billboard 200 and Mainstream Rock chart as well!! That album challenged the ordinary underground metal scenario of that time and create a revolution of the lifestyle of the Rockstar’s/Metalheads. You will find the old taste of Megadeth on their 10th album which ranked as #18 on Billboard 200 and most importantly a commercially successful album and receives positive reviews. Listed itself on the list of Billboards!! That album got positive appreciation from their fans and able to sold 200000+ copies of it just only in the US!! DAMN. Obliviously the 13th album of the band and picked up the 11th position on Billboard 200 n’ 34th on UK album chart!! Not only that, this time they were able to sell with a record-breaking album selling a record of more than 200000 copies in just a week!! DAMN. This time they released their top singles on I Tunes which paved their way of the tremendous commercial success of this album!! DAMN!! that album became the best album of the year 2016 as well!! Megadeth sold 50,000 copies of that album just on their very first week!! DAMN!!? The very first LIVE album of the band, based on their two concerts of the November 2001 based on the attacks of the horrible 9/11… songs like Kill the king, angry again, wake up dead, “A Tout le Monde” depicted the picture of Megadeth, that how frustrated and desperate they are for the revenge…..
A live album released in the memory of releasing the studio version of it after 20 years on their anniversary tour!! This is that was released on CD, DVD n’ Blu-Ray as well.